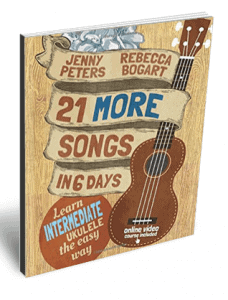 This book comes with over 100 minutes of video lessons hosted here on ukulele.io. Click to read more and see a complete song list. Learn to play tab melodies and read ukulele tablature, and get an introduction to the blues and blues improvisation in the key of C. Comes with 10 lesson videos to help you learn the songs. Named one of the 10 best ukulele Christmas books in 2017 and 2018 by ukulelemusicinfo.com. 21 seasonal favorites arranged in order of difficulty. There is a lesson video for every song in the book. Great for caroling or playing duets with fellow uke lovers. Learn how to fingerpick accompaniments, fancier strumming patterns, songs in minor mode, and songs with three beats per measure. And get more practice with the blues by playing more difficult blues songs in a variety of keys. Comes with over 100 minutes of video lessons. Learn 21 classic folk songs arranged in order of difficulty. The book begins with easy 2 chord songs and progresses to 7 chord songs in the key of G major. Includes favorites such as Happy Birthday, Take Me Out to the Ball Game, and Shenandoah. 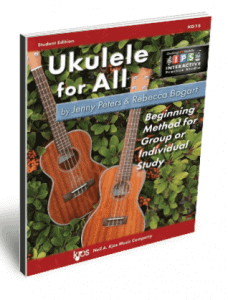 Drawing on Jenny’s experience teaching General Music, we developed Ukulele for All especially for classroom music teachers. There are both a Student Book and a Teachers’ Guide. Both come with Kjos Publishing’s Interactive Practice Studio software – included free – which offers multi-screen video lessons, play-along audio recordings and more for every song in the book. I’m brand new to music. Good for you for tackling something brand new! 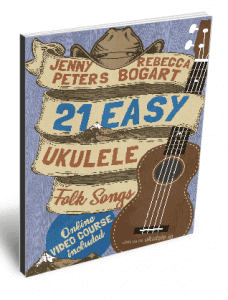 We wrote 21 Songs in 6 Days: Learn Ukulele the Easy Way (Book 1) just for learners like you. We begin with the easiest possible ukulele chords that use only one finger. The first songs use only one chord per song so you can concentrate on getting a steady strum going with your right hand as you sing. We add on other challenges very gradually so you can master each skill before you tackle a new one. We use familiar folk songs, but ff you don’t know how a song goes, you can play along with the free included video lessons. We also have several songs to teach each idea so you can skip a few here and there and still learn the skills you need. 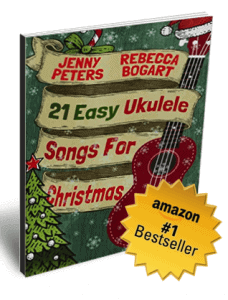 Once you’ve finished 21 Songs in 6 Days, you can either work your way through the series in order, or jump to 21 Easy Ukulele Songs for Christmas or 21 Easy Ukulele Folk Songs. Both these books start with two chord songs and have a fair number of three and four chord songs. I’ve got some music background. Even for folks with music background, mastering a fretted instrument requires different hand eye coordination than instruments like piano, winds, strings or drums. 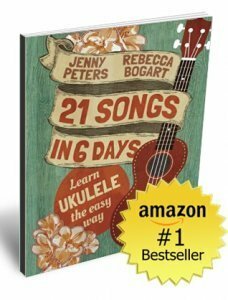 We recommend you start with 21 Songs in 6 Days: Learn Ukulele the Easy Way to help you learn to fret chords with your left hand while you strum with your right hand. All our books include standard music notation for all songs, so if you read music it will be easy for you to follow the melody and see when to change chords. They also include tab, which is an easy-to-learn way of notating what to do with your hands to get the right sounds from your ukulele. Once you’ve mastered 21 Songs in 6 Days: Learn Ukulele the Easy Way you’ll have a sense of how easy or how difficult ukulele is for you. If you went through 21 Songs very quickly, then you could jump to any of the other books in the series. 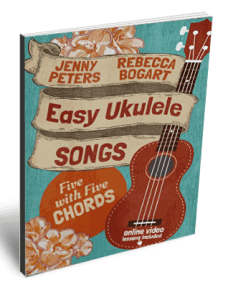 If you found 21 Songs took steady work to master, then we suggest you do Book 2 Easy Ukulele Songs: Five with Five Chords next. If you’ve played guitar you’re already familiar with fretting and strumming. You could probably dive right in to Easy Ukulele Songs: Five with Five Chords. If the songs in that book aren’t appealing to you, pick another one of our books with songs you’d like to learn. You’ll probably find learning ukulele comes pretty quickly for you.